Is India's Democracy Really in Decline? This is the first article in a two-part series evaluating the state of India’s democracy. Read part two here. Since independence, India has managed to stay on the democratic path in a way unprecedented among states freed from colonialism during the last century. Recently, however, the dominance of the Hindu nationalists under Prime Minister Narendra Modi – and the manner in which they have ruled – has given rise to claims that India’s democracy and its minorities are in grave danger. In some respects, the current Modi government has not undermined democracy or the standing of minorities any more severely than certain Congress governments in earlier years did. Moreover, by consulting unique data available through the Varieties of Democracy (V-Dem) research programme, we can determine that certain indicators of democratic performance started to decline already in 2009-2014, under the second government of Manmohan Singh. Furthermore, some of the negative trends to be observed seem to form part of a more general trend evident at the global level. However, policies pursued by the Modi government – together with political strategies carried out by extremist Hindu nationalists in civil society from 2014 onwards – co-vary with a dramatic and rapid decline in several indicators of democracy and liberal freedom. Freedom of expression has been curtailed; democratic deliberation has been bypassed; attacks on religious minorities have been carried out. Finally, India’s government – which used to try to uphold secular principles – now forges connections with religious actors in civil society on an unprecedented scale. The conclusions drawn here are that the Modi government bears significant responsibility for a serious recent decline in India’s democracy, and that this trend appears to be in line with its efforts to build a so-called Hindu rashtra – an ethnic Hindu state. The challenges for India’s democracy have been numerous, and often of extraordinary magnitude. Yet India has so far defied predictions about the end of its democracy. The country has managed to muddle through by applying innovative, responsive and novel strategies that moved the country forward – without becoming some kind of hybrid state or simply an authoritarian one. However, more recently it seems that something has gone wrong with the democratic project. In 2002, to begin with, Gujarat saw riots that claimed the life of more than 1,000 people – mostly Muslims. This happened on chief minister Narendra Modi’s watch, yet he was subsequently re-elected with even greater voter support. Modi’s roots in the Rashtriya Swayamsevak Sangh (RSS) created fear among minorities and secularists in the lead-up to the last national election in 2014, from which he emerged as the country’s leader. Since then, reports of harassment, together with politically motivated attacks and campaigns to turn India into a Hindu rashtra, have given rise to worries that India’s democracy is in danger. The anti-democratic symptoms are many. Groups and individuals who are or who have been claimed to be meat-eaters have been attacked by so-called ‘gau rakshaks’ – a term which is a kind of euphemism for criminal gangs sanctioned by forces in civil society to attack Muslims. The school curriculum has been narrowed and politicised – and in a way that goes far beyond the Hindutvisation drive conducted by the so-called ‘Batra-brigade’, or the efforts to politicise education under the Vajpayee government of the late 1990s and early 2000s. Journalists who have taken a critical stance in defence of secular values have been harassed or even killed. Gauri Lankesh is just one. Reporters Without Borders speaks of a ‘surge’ in such harassment. NGOs by the tens of thousands are losing their license to receive money from abroad. There have also been attacks against low-caste groups, followed by judicial processes that look like persecution and state-led harassment against Dalits. The most recent example is the Bhima Koregaon case. In the aftermath, a large number of social activists and academics have been harassed and arrested. Horizontally, government institutions have been captured and brought under control. The sacking of Raghuram Rajan as governor of the Reserve Bank of India (RBI), and more recent efforts by the central government to control the RBI, indicate that the Modi government is trying to reduce the separation of powers and to establish a more centralised system of control. The same applies vertically, allowing the BJP to synchronise its actions more effectively than ever before. There is no doubt the BJP and its supporting organisations have very effectively captured control in India – far beyond merely holding a majority in the Lok Sabha and thus being able to pass laws. Amrita Basu has shown in detail how forces forming part of the Sangh parivar are able to coordinate their activities and to exert their influence at the local, state and national levels – something which can result in what she calls a perfect storm, the tragic events in Gujarat in 2002 being the most important example. It might be objected, however, that it not the Modi government, the Hindutva movement or the Sangh parivar that have posed the main threat to democracy. Disturbances and attacks like the Gujarat riots have obviously taken place under non-BJP governments. The attacks on Sikhs in 1984 following the assassination of Indira Gandhi by her Sikh bodyguard led to casualties perhaps four times higher than in Gujarat in 2002, and members of Congress clearly orchestrated the riots. As far as the claim that the school curriculum has been politicised is concerned, the riposte is that it was so even before the BJP came to power. The retraction of NGOs’ licenses, finally, has been defended on the grounds that the organisations in question had not been adhering to proper standards of accounting. Additional counterpoints are naturally made in the ongoing debate on these matters in newspapers, social media and the political arena. It is obviously not possible here to review all of the allegations and events being discussed in the debate over developments in India with regard to democracy. One important counterpoint, however, has received considerable attention. 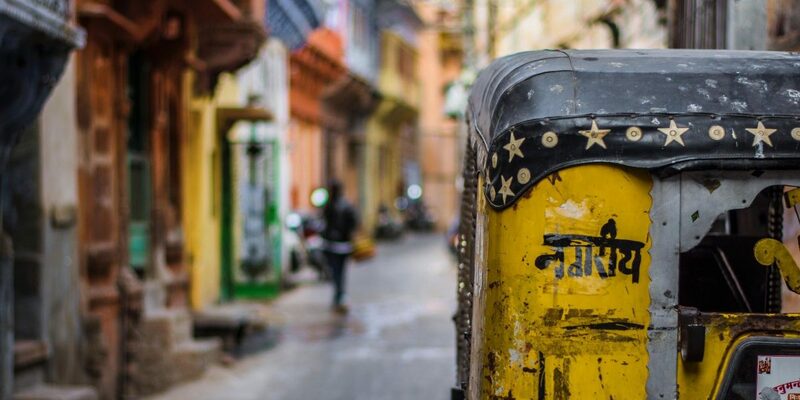 It can be summed up as the claim that many of the problems with India’s democracy have been grossly exaggerated, or that they were already present before. Therefore, it is important to uses available sources to describe how democracy in India has declined. To understand the direction in which India’s democracy is moving, we can use unique data collected from the Varieties of Democracy (V-Dem) project. The project is one of the world’s largest combined efforts to collect and publish country-level data on democratic performance. I have myself coded for the project. Also read: What Will Narendra Modi Be Remembered For? In the annual report 2018, the authors at V-Dem depict India’s decline in the area of democracy as serious. V-Dem’s findings are in line with charges made by PEN International regarding freedom of the press, as well as with reports from Amnesty International concerning violence against minorities. So, the main purpose here is not only to describe even further the decline of India’s democracy. Several sources suggest independently that it is. An even more central objective here is to describe what the decline looks like over time, to identify more precisely the areas where the most worrisome trends are, and to point out the composition of the government during the periods when the worst deterioration seems to occur. We begin with a look at India’s democratic performance from 1947 up to 2017. To do this, in Figure 1, we make use of V-Dem’s liberal democracy index, which measures civil liberties, the rule of law, and the independence of the judiciary, thus indicating how well minorities are protected by the state and the majority culture. This index also takes the level of electoral democracy into account. First of all, Figure 1 shows how quickly India managed to get on the track to democracy, in spite of all the challenges mentioned. For most of the time since the 1950s, India’s democratic performance has outshined that of most of the states which gained independence after the Second World War. Its constituent states were reorganised, the question of the national language was settled, and democratic elections became common practice. Also read: Is Populism Synonymous with the Right-Wing? The most significant break in the country’s democratic trajectory came during the Emergency mentioned earlier, from 1975 to 1977. Indira Gandhi’s 18-month-long suspension of democracy was comprehensive. In 1976 the liberal democracy index was down to 0.28, effectively turning India into an authoritarian state. In 1977, however, Gandhi kept her promise to restore democracy, and an impressive recovery took place. The hegemony of the Congress was broken, and new parties emerged as serious contenders. This is reflected in the continuous rise in both of the above indices up until the late 1990s. This took place despite the conflicts in Punjab and Kashmir, the assassinations of Indira and Rajiv Gandhi, and the tricky and violent relationship with Pakistan throughout the 1980s and the early 2000s. Since about 2008, however, the two indices have declined. When the last V-Dem survey was done in 2017, the liberal democracy index had fallen to 0.42. 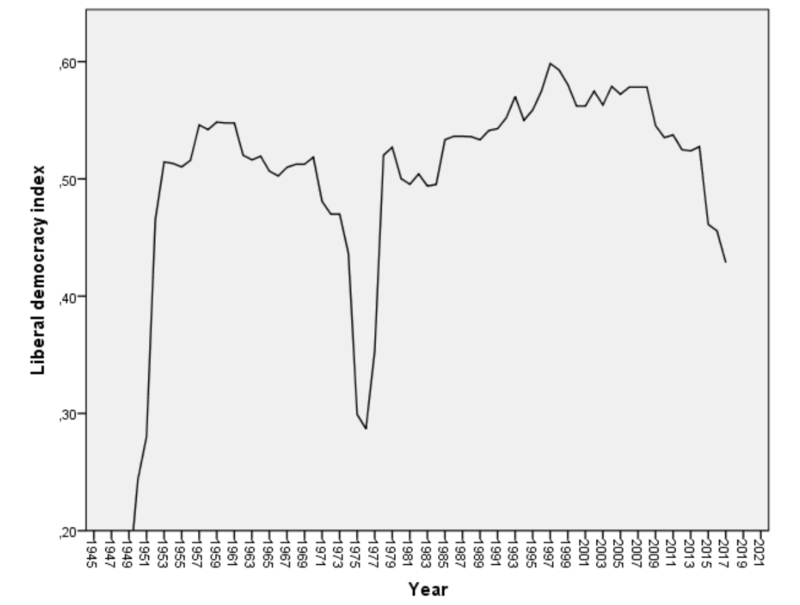 If the current trend is not broken, by the mid-2020s, the liberal democracy index will be down at its level from 1976. The long-term trend to be observed, then, is as follows. The Congress party was responsible, 40 years ago, for the sharpest interruption in India’s democracy so far. After that democracy recovered, and for a long time there were no major declines, notwithstanding several conflicts and other traumatic events. About 2008, however, a decline in democracy set in. It took place during Singh’s second term in office. Then, when Modi became prime minister, the decline got far steeper. For measuring democratic performance in India from 2004 to 2017, we begin by using indices that focus more specifically on civil liberties and deliberation. As can be seen in Figure 2, these indices too follow similar patterns, although there is important variation in how much they change over time. The liberal component index (LCI) “emphasises the importance of protecting individual and minority rights against the tyranny of the state and the tyranny of the majority”. It does so by focusing on “constitutionally protected civil liberties, strong rule of law, an independent judiciary, and effective checks and balances that, together, limit the exercise of executive power”. Although this index shows some fluctuation during the Manhmohan Singh governments, a somewhat more steep decline sets in 2014. This seems to be a part of what may be a downward trend – albeit one from which India could most likely recover fairly quickly. That does not, however, seem to be the case with the deliberative component index (DCI). The DCI “focuses on the process by which decisions are reached in a polity”. A democracy relies on communication between power holders, the government and citizens, with the outcome not being decided by locked positions formulated in advance. As Jürgen Habermas, the German philosopher, has pointed out, a government’s legitimacy does not come from telling citizens what to do. It comes rather from communicating the reasons for a decision, and being prepared to change one’s mind. This implies – and that is what the DCI is designed to capture – that political decisions are defended and justified by reference to the common good. It also means decisions are reached in “respectful dialogue at all levels – from preference formation to final decision – among informed and competent participants who are open to persuasion”. Also read: Ten Reasons Modi is Just Like Indira Gandhi. And That’s Not a Good Thing. Here we see that the Manmohan Singh government coincides with a slight decline which then stabilises – a change roughly within the margin of error. In 2014, however, sharp decline begins. The DCI falls from 0.85 in 2014 to 0.49 in 2017. 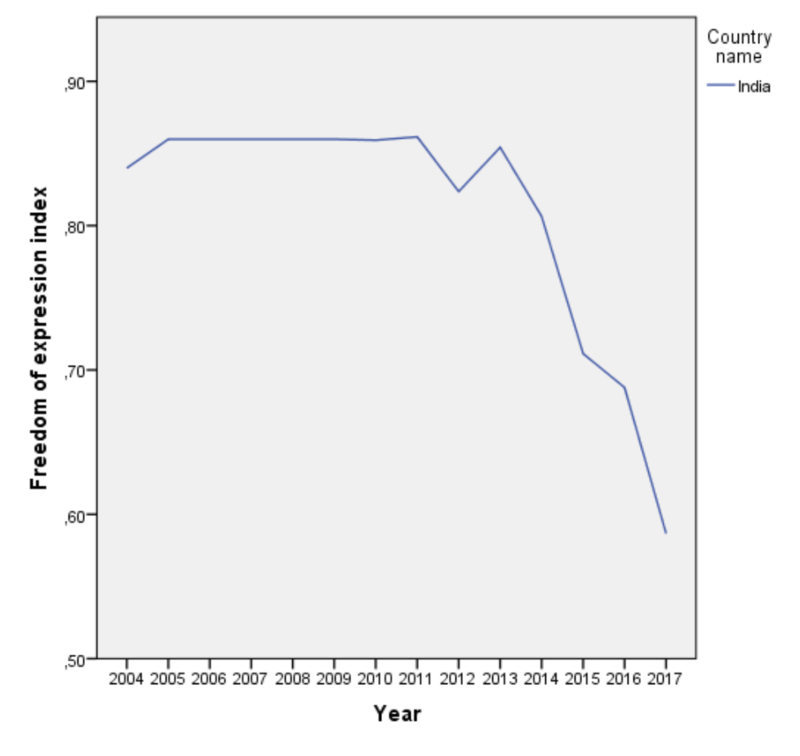 If we consider the freedom of expression index (FEI), we find more signs of democracy’s decline in India. The FEI measures the extent to which a “government respects press and media freedom, the freedom of ordinary people to discuss political matters at home and in the public sphere, as well as the freedom of academic and cultural expression”. Figure 3 shows how the FEI is first stable for some years, after which it falls dramatically – from 0.81 in 2004 to 0.59 in 2017. 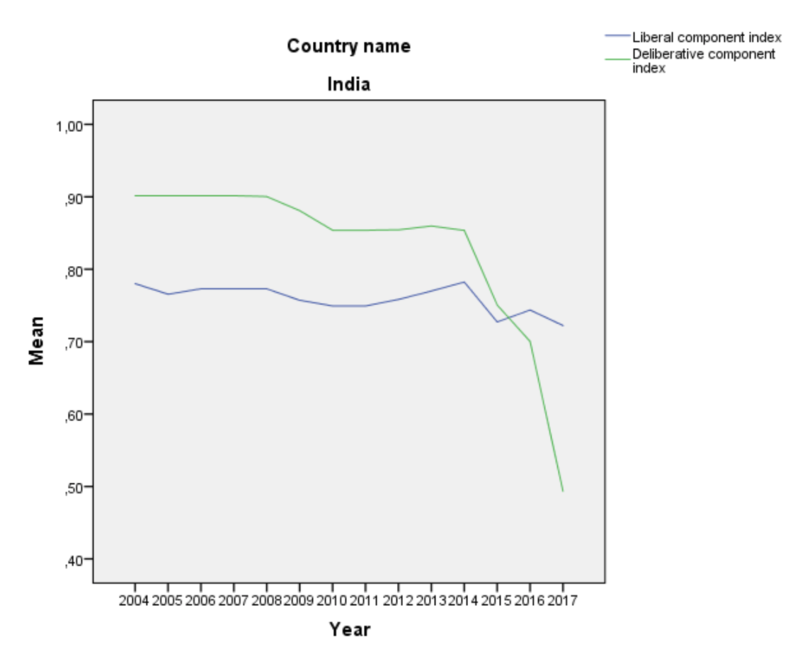 Evidently, the trends we can observe by using the data from V-Dem supports the claim that India’s democracy is in decline and that the more recent downward turn has been the most dramatic since prime minister came into power in 2014. Then the question is, what is the Indian state turning into. This article has been written as part of the TOLEDO project at the Department of Government, Uppsala University. The author would like to thank Jan Teorell at the V-Dem project, Peter Mayers, Ingrid Forsberg and generous Indian readers who helped in the process of completing this text. 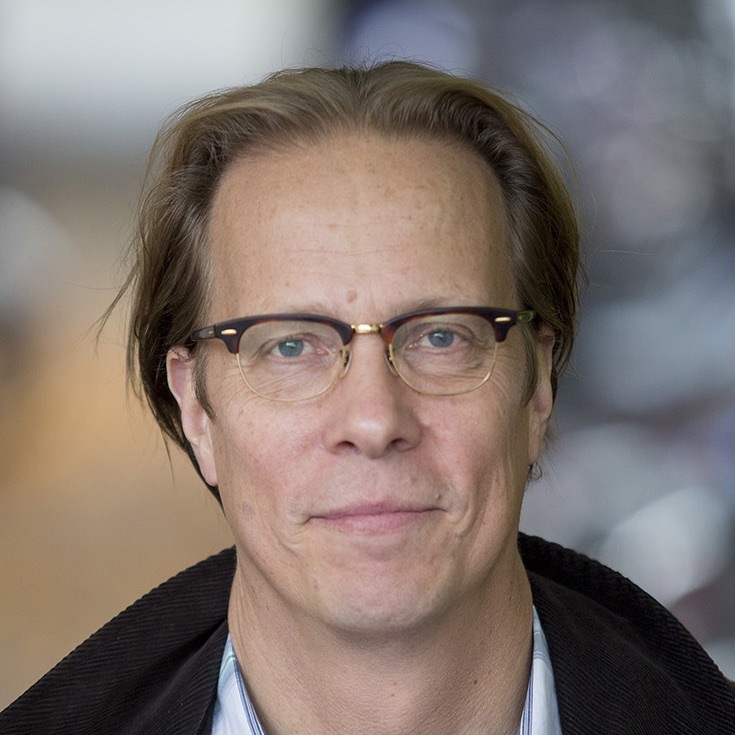 Sten Widmalm is professor in political science at Uppsala University, Sweden, and the author of Political Tolerance in the Global South – Images of India, Pakistan and Uganda (Routledge, 2017) and Kashmir in Comparative Perspective (Oxford University Press, 2006). Sources and appendices to this article are published at the author’s homepage. All data used can be downloaded from V-Dem.